On this date in 1942 on the Eastern Front, Adolf Hitler launched Ger­many’s second sum­mer cam­paign against the Soviet Union in two years. (The first had been Opera­tion Bar­ba­rossa begun the previous June, which had been in­tended to knock the Soviet Union out of the war.) Ignoring the Soviet capi­tal Mos­cow, whose fierce defense com­bined with a brutal win­ter had pre­vented its cap­ture earlier in the year, Fall Blau (“Operation Blue”) was in­stead directed south toward the stra­tegic Cau­casus oil and mineral fields and important centers of Soviet war industry. The Ger­man armored ad­vance resembled a knife slicing through a stick of butter—a re­run it seemed of the sum­mer of 1941, when the Red Army fell apart on the first armored im­pact. Making steady pro­gress across the empty Ukrai­nian steppes, Army Group South (A) took the key rail­way junc­tion and river port Rostov-on-Don on July 23, and then drove south to the oil­fields in the Cau­casus. On August 23 Gen. Fried­rich Paulus’ Sixth Army, part of Army Group South (B), entered the out­skirts of Stalin­grad (today’s Volgo­grad), a vital manu­fac­turing and trans­port cen­ter up­stream from Rostov. 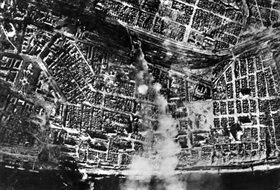 That same day a mas­sive Ger­man air raid on Stalin­grad caused a fire­storm that killed thou­sands of civil­ians and turned the city of 900,000 res­i­dents into a landscape of rubble and burned ruins. Neither Ger­many nor the Soviet Union could have fore­seen the horror that would face each other at Stalin­grad. Paulus’ Sixth Army was inex­o­rably drawn into a Soviet quag­mire from which it was nearly im­pos­sible to escape. The 199‑day battle for con­trol of Stalin­grad pro­duced a monu­mental two mil­lion ca­su­al­ties on both sides. Stalin­grad was the worst defeat the Soviets in­flicted on Axis forces up to that time. Some 105,000 pri­soners were led away, most to their deaths. Only 6,000 POWs lived through their ordeal to return to their homeland after the war. 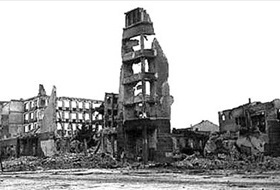 Left: Beginning on August 23, 1942, the Luft­waffe bombed Stalin­grad block-by-block for five straight days. Fire­storms killed anywhere from 25,000 to 40,000 people. After August 25, the Soviets stopped recording civil­ian and mili­tary casu­al­ties as a result of air raids. The Luft­waffe also rendered the River Volga, vital for ferrying supplies into the besieged city, unusable to Soviet shipping. Photo from late August 1942. Right: Stalingrad’s desperate defenders realized that their best defense con­sisted of an­choring their defense lines in numer­ous buildings. Thus they con­verted multi­story apart­ment houses, fac­tories, ware­houses, corner res­i­dences, and high-rise office buildings into strong­holds bristling with ma­chine guns, anti­tank rifles, mor­tars, mines, barbed wire, sni­pers, and small 5–10 man units of sub­machine gun­ners and gre­na­diers prepared for house-to-house, hand-to-hand combat. Left: A reconnaissance photo of a rail­way station burning in Stalin­grad, late August 1942. One rail­way station changed hands 14 times in six hours. The Ger­mans killed 2,500 Soviet soldiers each day, day after day, three times their losses. 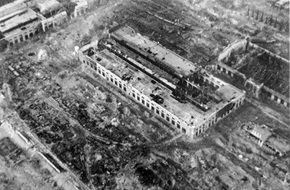 Right: German bombers flatten Stalin­grad’s indus­trial center, November 16, 1942. The Luft­waffe retained air supe­ri­ority into early Novem­ber, but after flying 20,000 in­di­vidual sorties, its ori­ginal strength of 1,600 service­able air­craft had shrunk to 950. It shrank further following Allied landings in North Africa (Opera­tion Torch) in Novem­ber 1942, when Ger­mans were forced to with­draw air­craft from the East­ern Front in an ulti­mately failed attempt to save Axis fortunes in the Mediterranean. 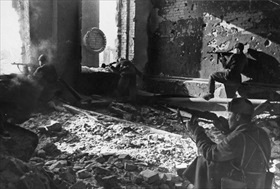 Left: German infantry try to find cover in the wilder­ness of rubble that Stalin­grad had become. Photo from Septem­ber 23, 1942. Bitter fighting raged for every fac­tory, rubble-strewn street, house, base­ment, stair­well, and sewer. The Ger­mans called this ever-present, often un­seen urban war­fare Ratten­krieg (“Rat War”). They bitterly joked about cap­turing the kitchen but still having to fight for the living room and the bedroom. 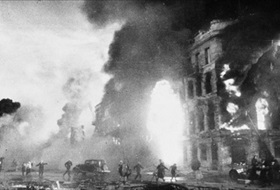 Right: A scene of the destroyed city center, Stalin­grad, date un­known but likely autumn 1942. The Battle of Stalin­grad bled the Ger­man army dry and turned the war in the East deci­sively against Nazi Ger­many. 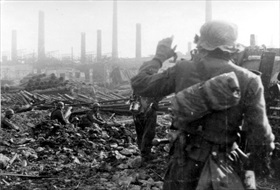 For the hero­ism of its defenders, Stalingrad was one of four cities awarded the title “Hero City” in 1945.